Basement chest freezer! If you eat a ton of ice cream, you need one of these in your life. I can leave stuff in here for months without damaging the product because there is no auto defrost cycle.... as is painfully evident by the ice crystals forming everywhere. Sorry about that, but I pick up a neat trick last year. I used a tupperware container and a plastic spatula to effectively shave the ice off last year. It sure beat emptying the entire thing. Oh, do you ever wonder where all the ice comes from? 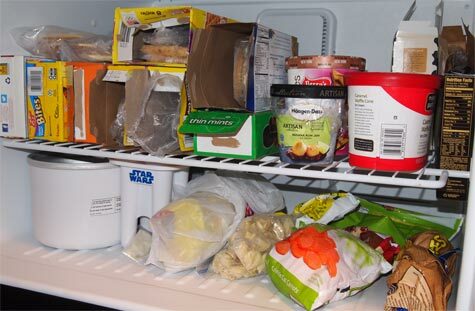 Just think about your frozen goods when you get home from the grocery store. They are covered in condensation right? Well, that condensation has to go somewhere! 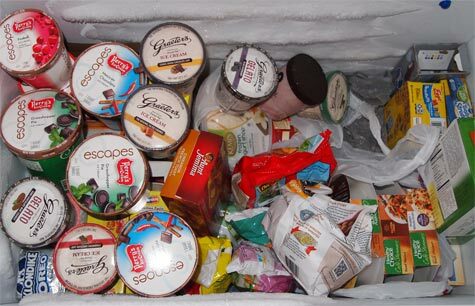 As you can see, it's very full with recent shipments of samples from Perry's and Graeters. Perry's has always been good to us and I was a little worried about talking to Graeters since they switched marketing companies, but they came through nicely. I almost wonder if they went back and read a few old reviews because I once wrote that I wish I could try there black raspberry flavor without the chips and look whats in my freezer now! What else is buried in there? New popsicles that my daughter will help me review, another kemps froyo, another tasty container of Hood fried ice cream, and Talenti flavor #8 which tends to be hard to find but was at Market Basket for some reason. You know, this photo is a bit deceptive because there is another layer of stuff underneath, and I dont just mean veggies and healthy choice cafe steamers (what? they're fairly taste and not too bad on the sodium or the wallet). There's a pint of one of the new dannon flavors in their, a rockin cotton candy sundae cup from Friendlys from last year.... even a really old pint of talenti peppermint bark that I bought as a treat sometime before Christmas 2013. (time passes.... and now it's 9:20 in the evening and I still havent finished this post despite thinking about stuff to say for the last week or three. I really wanted to babble!). I want to make two important points first. One, keep those comments coming! I mean that. Someone left a comment earlier on an old post were I was so-so on a product, and the person said "sorry, but we enjoyed these". Please don't ever be sorry, ever. I'm happy you like something, I dont want you to be sad, that's why the blog is here, it's to help, not to hinder or to put down. Enjoy your treat no matter what it is. The only thing I ask is that you be respectful. Every now and then we get the commentor who demeans everyone who disagrees. Don't demean, describe. Tell us why you feel how you feel. You don't have to be super specific, but share what you can, and we'll all be better off for it. And my second point... ummm, kind of related to the first one, and Nick called me out for saying this before, but I really am trying to be more helpful this year. I'm not an expert and I dont like people who think they are (if you are an actual expert, that's cool, I know you worked hard to get there). I'm just a guy with a spoon. We're here to just help you gain perspective. Maybe help you notice something you missed. Maybe help you look at something from the point of a similar product. Pint A might be good, but look to your left, Pint B is epic. Maybe we save you a few bucks along the way or maybe we give you that little nudge you needed to try something new, but it's only a suggestion. Come for the pictures or come for the words, whatever helps is fine by us. But seriously, we'll just keep on chugging for now. We've been trying to keep a steady stream of new products coming at you but it's tough sometimes. So much stuff came out at once and I have no urge (or money) to shove several products in to one review and then several more in to the next. I'm crazy, but I'm not that crazy. I always say it's about pacing your self and balance, and that's how we review things. Why do I get the feeling I'm starting to talk in circles? I better wrap this up. The point is I hope the balance is ok between getting reviews out quickly but covering a decent diversity of companies along the way. So, in closing, thank you for being awesome and hanging out with us. Please please please feel free to leave comments. If you can, tag your comment with a name or nickname so we know who is who. Most importantly, keep on scooping your favorite treat. It doesnt matter which company or product it is, just enjoy it, share it, talk about it with us or your friends. We're on facebook if you prefer to discuss that way. We're also on twitter but it's harder to get a discussion going there. Big fan of the blog. You two help me choose my pints, and I rarely disagree with your assessments. Thank you for all the time and effort you put into it. Happy Anniversary! I've been you pretty much from the beginning and am so happy at the success of this humble little blog :) I always enjoy your banter, keep on scooping! "I'm just a guy with a spoon" Best. Line. Ever. Happy anniversary, keep the scoops coming!!! This blog makes me smile (and gives me an excuse to buy/eat more ice cream)! Absolutely love your blog!!! Thanks for all the amazing reviews! Keep up the awesome job! Are those Star Wars Popsicles?! I agree with the desire for the Nosh show to be weekly!! Happy Anniversary Dubba! Looking forward to Nick's post as well. I found your blog a few years ago while huddled in my apartment waiting out a hurricane. I was so stressed but still had power and read the whole blog from beginning to end. Been addicted ever since! You've both done a great job on keeping up on all the new products. Although I can't get a lot of them in my tiny town I still love to know what's available. Keep up the great work and happy scooping! Hello. I've never commented before but I discovered your blog a few months ago and now I read it every day on the bus to work! I'm from the UK and unfortunately I cannot get 99% of the products you review but you both write reviews that are very enjoyable to read :) Happy anniversary! i found this blog maybe a year ago? i'm not sure.. but i haven't been following for too long. anyway, i'm happy i found you! i appreciate all the hard work that goes into eating copious amounts of ice cream and frozen dessert for us ;) honestly, i don't eat that much ice cream, but i love reading your reviews on it! 7 years going strong is certainly nothing to sneeze at. I can speak for myself and, I think, everyone else here when I say thank you for such dedication to this particular craft for such a good chunk of time. It is most certainly respected, admired and appreciated. Keep it up, Dubba! Oh, and that chest freezer looks incredible.